A case-study approach is used, with practical activities that develop students' confidence and competence for the CXC exam and today's busy office environment.The third edition of this popular text retains all the features that have made such a success of the first two editions, and has been updated to include:New material to cover changes in the CXC syllabusA full guide to the SBA component of the examinationAdditional recent CXC questions from past papersRecent changes in office practice, such as the use of new equipment and e-mailA revised, modern design, which makes all the features of the text clearer and easier to work through. 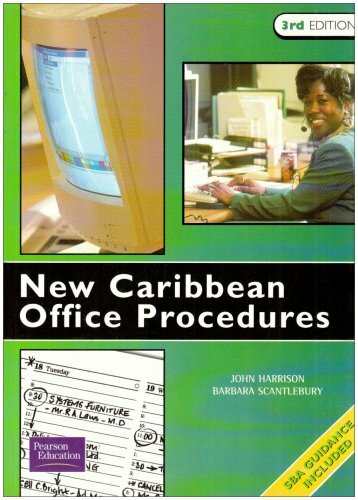 Together, these features make New Caribbean Office Procedures the ideal introdution for students preparing for the CXC examination. John Harrison is a well known business studies text book author and is the Overseas Development Officer of the Society of Teachers in Business Education. Dr Barbara Scantlebury is a former Assistant Examiner for CXC, with experience of teaching in Barbados, Jamaica, England, Canada and the USA. She has been Head of Business Studies at Alexandra School, Barbados and a part-time tutor in Business Studies at the Erdiston Teacher Training College, Barbados. Currently she is Professor in Business and Information Technology at a college in the United States.